This is not my first trek down the rabbit hole and into the crazy epic theatre world of Bertolt Brecht. Being both impressed and dazzled by my previous sojourn, the idea that Humber Theatre (Humber College being my own alma mater) was taking on Brecht’s The Caucasian Chalk Circle immediately piqued my curiosity. Accompanying me for the evening would be my friend Grace, my previous Brecht date. 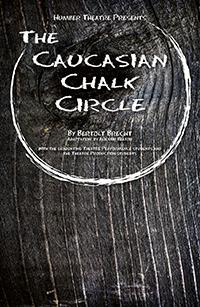 The Caucasian Chalk Circle is fashioned loosely as a play within a play featuring a community of villagers exhausted from the aftereffects of war. Within this play, a servant girl takes on the care and raising of an abandoned baby, the Governess’ child, and endures two years of hardships and struggles in order to raise it. The final question remains: who is the true mother? There’s something uncanny and fantastical about Brecht’s work, and how that translates is simply this — expect the unexpected. I didn’t go into this performance expecting a musical with many an ensemble song piece and intricate movement work. I didn’t expect to laugh as much as I did — at times out of the awkwardness of overly hokey moments on stage, at most times because it was actually funny. I didn’t expect that college-aged theatre students could pull off a performance with this much demand in dialogue, music, singing, movement, prop work, staging, and sheer acting chops — all within limited space in an over two-hour production with such magnitude. Great work! Each performer is on stage doing at least triple duty: performing as multiple characters, singing and dancing as part of the ensemble (with the ensemble movement even used to create set pieces), and for some playing instruments as well. This was a great feat of allowing these students to really show off their multifaceted performance chops. What surfaced as the one facet that truly spoke to Grace and I was the cast’s magnificent use of movement and staging, exceptionally crafted by choreographer and director Maja Ardal. I loved their use of sticks, one that each performer carried, that translated into multiple props, a source of sound effects, and even part of the ensemble moving sets. I was also thoroughly impressed by the vocal talents that rang through the ensemble, the cast have really worked hard on honing their singing vocals and kudos for music director John Millard for allowing them to shine. Granted, this production is not perfect. A number of the performers still seem to be settling into their voices and the dialogue often comes off as being shouted rather than stage spoken. It comes off as trying to deliver over the top rather than allowing subtlety to carry the point. That’s something that I’m sure they’ll develop over time as they settle into themselves as actors. I also found the second act seemed disjointed from the first where the first act followed Grusha Vachnadze (well performed by Vanessa Spence) closely in all she had to endure raising the baby on her own with hardly anything to her name. After the intermission, a good portion of the second act followed Azdak (Hilary Wirachowsky) becoming judge and how she clearly lacks any sort of training for the part but allows for her street savvy and wit to guide her. Driving that part home felt overdone to me and as amusing as it was to watch, I waited to continue with Grusha’s story. Grace pointed out that that was a Brecht-ism, being more verbose than needed. One other thing that also stood out for me — their use of puppetry in portraying Michael, the abandoned baby, shown aging and moving through great use of a puppet. Humber Theatre‘s run of The Caucasian Chalk Circle is quickly coming to a close with only a few performances left. For impressive student theatre that also comes at an inexpensive ticket price, this is a fine choice. Caucasian Chalk Circle is playing at the Humber Arts and Media Studios (300 Birmingham Street, Etobicoke). Performances run until February 22. Show times are at 7:30 pm with an additional matinee on February 22 at 2 pm. Tickets are $15 for adults, $10 for students/seniors, and $5 for alumni. Tickets can be reserved via email at humber.theatre@humber.ca or by phone by calling (416) 675 6622 ext. 3080. Promotional image provided by the company.